Michael McKeon is project manager for transatlantic relations at the Washington DC-based Bertelsmann Foundation. US Trade Representative Michael Froman and EU Trade Commissioner Cecilia Malmström meet this week for a stocktaking session in Washington to review the status of the Transatlantic Trade and Investment Partnership (TTIP), to discuss outstanding issues and plan for the coming year. The meeting follows an intense but productive 12th round of negotiations and reflects the parties’ commitment to accelerate talks and achieve as much as possible in 2016. TTIP negotiators discussed several important trade and investment topics for the first time or in greater depth in the past weeks, and look to make meaningful progress on these issues before the next round. The 12th round comprised a full three weeks, with intercessional discussions on regulatory cooperation and government procurement the week before and the week after the formal round, which began on 22 February. The round was the first of 2016, which for better or worse will be a fateful year for the transatlantic trade pact. Froman and Malmström continue to push for TTIP’s conclusion this year, but a growing chorus of sceptics questions the practicability of that goal. Some US officials have recently said publicly that negotiations may not conclude under the administration of US President Barack Obama, emphasising that the agreement’s substance, not its timeline, should drive the talks. The US Congress’ consideration of the Trans-Pacific Partnership (TPP) and important elections on both sides of the Atlantic will also likely complicate TTIP’s 2016 prospects. Negotiators discussed government procurement, marking the first time that both parties had put forward texts on the issue. Greater access to the US procurement market remains a major offensive interest of the EU, even though the European Commission has modest expectations of what the United States is willing or able to offer. European Commission officials have acknowledged that the United States cannot offer public procurement concessions at state level without the consent of local authorities. The EU is pressing for the expansion of market access through the removal of flow-down restrictions, which require state projects that use federal funds to work with domestic bidders. Relatively little progress was made in the first exchange, but negotiators are expected to continue discussions in the coming months. US and EU negotiators formally commenced discussions on the EU’s proposal for the establishment of an investment court to replace the increasingly contentious investor-state dispute settlement (ISDS) mechanism. Among other innovations, the EU proposal would enshrine governments’ “right to regulate” in the public interest and create an appellate mechanism and a standing list of arbitrators who could adjudicate cases. The United States has maintained that ISDS is a necessary component of a comprehensive trade and investment agreement, and is unlikely to agree to the entirety of the EU proposal. According to US and EU officials, negotiators worked on identifying elements common to both systems and made good progress during this initial discussion. Regulatory issues featured prominently in the 12th round of TTIP talks, with a full intercessional week before the formal round dedicated to discussions on regulatory cooperation. Negotiators made progress on both horizontal and vertical regulatory alignment. The United States presented a proposal to establish a mechanism for regulator-to-regulator dialogue within TTIP, and the EU plans to make a similar offer in the 13th round, scheduled for April 2016. Although the two sides have not agreed on its form, the mechanism would facilitate cooperation among officials in the United States and the EU on both existing and new regulations. The parties presented texts on regulatory transparency that establish internal coordination practices, such as impact assessments and retrospective evaluations of regulatory acts. Although they are not yet in full agreement, the EU and United States are coming closer in their proposals to publish and solicit stakeholder input on draft regulations before they move through their respective legislative bodies. The United States continues to the push the European Commission to adopt a US-style notice-and-comment procedure, wherein it would publish a draft text of legislation for public comment before submitting it to the European Parliament and the Council of the European Union. EU critics of this proposal suggest that it would give US stakeholders undue influence in the EU legislative process. The parties hope to agree on consolidated texts by the 14th round of TTIP negotiations, to take place in Brussels in July 2016. Negotiators expect that only the most politically sensitive elements of regulatory cooperation will still be bracketed, or under discussion, at that point. Although discussions on tariffs are further along than other areas under negotiation, the parties still have significant work to do on market access. The most recent US and EU tariff offers would eliminate 97% of transatlantic duties at some point after TTIP enters into force. The EU is seeking longer phase-out periods for sensitive goods such as automobiles, and in some cases is linking its offer to US concessions in other areas, such as agricultural non-tariff barriers and protection for European geographical indications (GIs). The outstanding 3% of tariffs cover goods of high political sensitivity, including agricultural products such as dairy and poultry. In a recent civil society event, Malmström said that the EU would seek to exempt some of these goods from tariff elimination under TTIP, adding that EU member states are compiling their own lists of products to exclude. US chief TTIP negotiator Dan Mullaney has maintained that the parties will continue to work towards the eventual elimination of all transatlantic tariffs. Officials are expected to address these sensitive issues during the so-called “end-game” of negotiations, which they hope will take place around October of this year. Financial services remain a point of contention between the parties. The EU has not proposed a financial services tariff offer because it links duties in this sector to regulatory cooperation. The United States wants to include financial services market access provisions in TTIP, but insists that regulatory issues are better left to multinational fora. Negotiators made progress in chapters that fall into the trade rules category. The United States presented proposals on labour and the environment, which negotiators report are in line with text of other US free trade agreements. Notably, the United States is committed to subjecting these chapters to dispute settlement. The EU offered texts on labour and the environment under a single proposal entitled “Sustainable Development” in previous rounds. 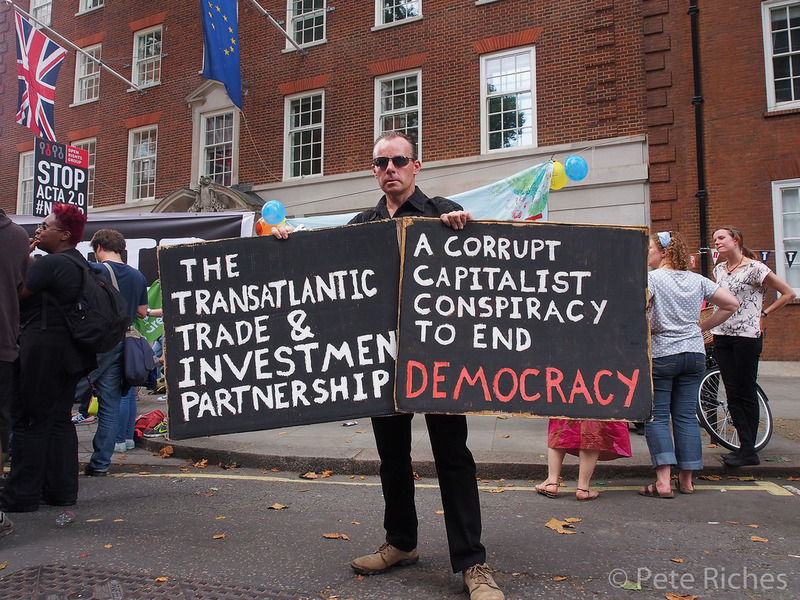 Although the EU has never linked these issues to dispute settlement provisions, the European Commission has indicated that it may be willing to do so in TTIP. Discussions on intellectual property progressed, covering a range of issues, including enforcement, geographical indications (GIs) and cooperation mechanisms. Negotiations on rules of origin continued, but the parties remain at odds over content requirements for several classes of goods, including automobiles and textiles. In other transatlantic trade news, US and EU officials have agreed on a new data transfer deal, dubbed the EU-US Privacy Shield, to replace the Safe Harbour Agreement that the European Court of Justice invalidated in October 2015. The text of the agreement was released on 29 February, and is expected to be approved by the European Commission and EU member states in the coming months. On 24 February, Obama signed the Judicial Redress Act into law, allowing EU citizens to bring civil suits against US authorities over alleged data mishandling. These developments will likely accelerate once-stalled areas of the TTIP negotiations, namely provisions related to digital trade. US and EU officials report that, in an effort to accelerate negotiations in 2016, the parties will hold regular intercessional discussions between formal rounds. Meanwhile, Froman and Malmström will meet again in Brussels on 18 March for a second stocktaking session. Negotiators hope to propose text for all chapters of the agreement by this summer, and to reach the final stage of talks by October.